Mohammad Parvaiz was the innocent victim in a long, racially-aggravated dispute between two groups of men. The 41-year-old minibus taxi driver was dragged screaming from his cab and beaten to death in July by several white teenagers in Huddersfield. Two 18-year-olds, Graeme Slavin and Christopher Murphy and 17-year-old Steven Utley have been found guilty of murder. Michael Hand, 19, had earlier pleaded guilty to murder. The teenagers attacked the cab with bricks and rocks and Mr Parvaiz was pulled from the vehicle, punched, kicked and beaten. The assault only stopped when a woman shouted that she had called the police and the attackers ran off - leaving the father-of-three bleeding in the road. He died later in hospital. Field Head resident Sonya Lowell said she would never forget what she saw from her bedroom window that night. "To think that an innocent man came to pick up a fare and little did he know he only had moments to live," she said. "He actually was going to his death. "He just had time to stop before they rushed him and it was just hell that broke loose. "They smashed the car, smashed the window and I saw a stick going through the windscreen. "I shouted to them that I'd called the police. They just ran off across the fields jubilantly. They were just jubilant," she added. Michael Beeby, 16, and Jason Harris, 17, were found not guilty of murder and manslaughter. Beeby was found guilty of violent disorder, a charge which all the other defendants had previously admitted. Earlier in the year, Mr Parvaiz had taken a group of Asian youths to an address in Golcar, and been told to wait for them to return. The flat was occupied by teenagers including Hand, Slavin and Murphy. Unbeknown to Mr Parvaiz, there was a history of racial tension between some of the teenagers and his passengers. As he waited, an argument broke out and the Asian youths smashed up Murphy's scooter. The 18-year-old and friends noted down the taxi's number, thinking it could be useful in plotting a revenge attack. Five weeks later they rang the cab firm asking for a minibus to take them from Field Head. But Mr Parvaiz was scared and felt something was not right - so he did not turn up. Some of the teenagers had been drinking and smoking cannabis with some girls, who they then persuaded to call up and order the minibus - with fatal consequences. Mr Parvaiz, a taxi driver for seven years, lived in Birkby, Huddersfield, with his wife of 15 years and their three children. 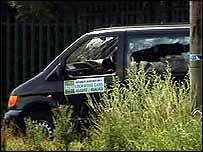 His attack, on 22 July last year, raised questions about how safe taxi drivers are in the area. Around 3,000 of Mr Parvaiz's cab driving colleagues across Kirklees staged a seven-hour strike after his death, demanding better protection.